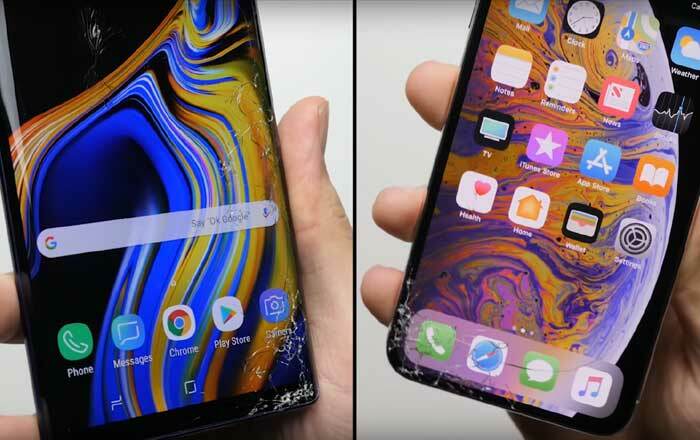 The iPhone XS Max has already gone through a couple of drop tests online, but a new one compares it head-on with its biggest rival – the Samsung Galaxy Note 9. It’s an interesting video to watch, if only to see which glass-covered handset will win the race. PhoneBuff’s first round involves a simple back drop test. The Galaxy Note 9 does very badly in this test, cracking all over. The iPhone XS Max did much better, splintered a bit at the bottom and suffered a single crack diagonally across its back. The YouTuber suggests things turned out this way because of the iPhone XS Max’s protruding camera. It’s possible the module helped break the fall, while the Galaxy Note 9’s much slimmer camera couldn’t replicate this. In any case, the Apple offering was the clear winner of this round. The next test sees the smartphones getting dropped on their corner. Both held up pretty well, with no further damage to the glass and only a few scuff marks. This round thus ended up as a tie. The third evaluation was a face drop. The iPhone XS Max again repeated its round one success here, limiting damage to just one corner. On the other hand, the Galaxy Note 9’s panel had cracks everywhere. The final test is a bonus round where the duo is dropped repeatedly from a height of about 5 feet until they stop functioning. This is where the Samsung phone flexed its muscles since it was able to survive for 10 rounds before dying. The iPhone XS Max couldn’t keep up, giving up after just 3 rounds. While the device remained functional, apps in the second and third row wouldn’t respond to touch, meaning that section of the display was probably dead. In the end, the Galaxy Note 9 won by a single point because of how it performed in the bonus round. Whichever device you choose, it would be a good idea to buy a case to prevent glass damage.